Wednesday, August 22 at 6:30 p.m., at our Midweek Run, test run a pair of 361! Saturday, August 25 is 361 Day! Visit with 361 reps, receive 10% off 361 shoes and get a Gift with Purchase! Hey guys and gals of Track Shack and beyond! Shane here again, and today we are going to be diving into a relatively new company— 361. This review is going to be a little bit different in the sense that I’m going to be giving a sort of “brand review” as opposed to a single specific shoe. So strap in, lace up, and let’s get started! 361USA first debuted in 2014. The former VP of footwear at Asics, Jim Monahan, decided he wanted a crack at a new line of shoes, and thus 361 running was created. Before they produced any footwear they did extensive lab testing on a new, responsive type of foam the dubbed Qu!kfoam. Yes, you read that right, they were so excited about it they had to start exclaiming in the middle of the word! The result of the testing was a success and their first shoe the Sensation was released and awarded Best Debut by Runner’s World Magazine. So what makes the Sensation so great and why would you switch your shoe to such a relatively new company? On a BROAD scale without diving too deep, 361 has a fairly similar feel to Asics. The contoured fit on the medial side of the foot is second to none! To delve a little deeper, the Sensation is what they call their “mild stability workhorse”, and it achieves this via it’s dual-density medial support. To put this in layman’s term, that’s a denser foam on the inside of the shoe that prevents your arch from over-pronating. The Sensation also has a Qu!k Spine, or a carbon fiber plate on the midfoot of the shoe to ensure there is a strong foundation for you to grind out those miles. yet responsive shoe, and need some control for your arches, I would definitely recommend at least giving this shoe a try on and a fair shake. As always, the wonderful shoe experts here at Track Shack can make sure that it is a proper fit and style for you but come in and try it out! Shifting gears a little bit, let’s talk about the other side of the shoe isle, the Meraki. 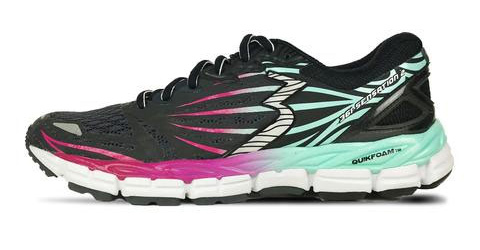 The Meraki is a neutral cushioning shoe that offers a pretty comparable fit and feel to the Cumulus from Asics. Obviously, this an opinion of one humble blogger, definitely something you should try for yourself. The Meraki has all of the tried and true tech the Sensation offers, but without all of that support for the arch. It still has the Qu!k Spine in the midfoot to give your foot that reliable platform to perform on. The cushioning can definitely take the pounding of the pavement that we are all familiar with in Central Florida and let you hammer out those miles without having to worry about your shoe keeping up with you. I recommend trying the shoe on because it does fit narrow. They do offer wider widths so if you need that extra space for your toesies, it should be accommodating. Again for the nerds out there, the shoe has a 9mm heel toe drop and a weight of 10.4oz for men and 8.5oz for women. Though 361 is one of the newer shoe companies on the market, that doesn’t mean they are not worth a try. So far they live up to their slogan and take things “One Degree Beyond”. 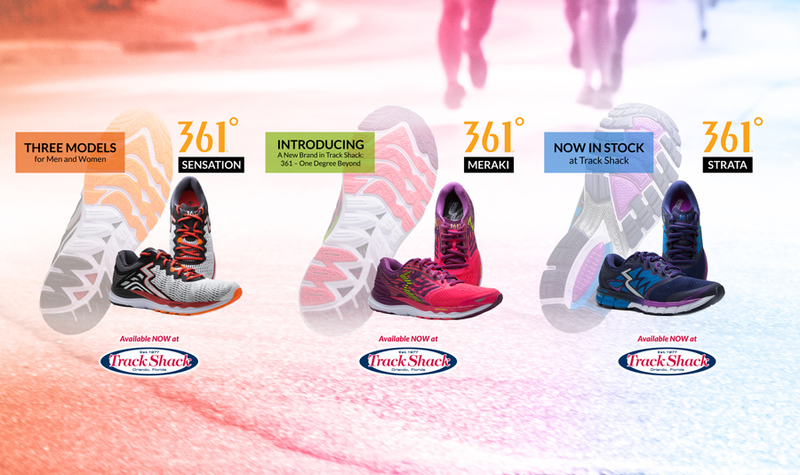 The continue their excellence in a few other shoes in their lineup. The high cushioned, neutral Spire and the high-structured cushioned Strata! So come in, try them out and upgrade your run! What’s your experience with 361? We’d like to hear!